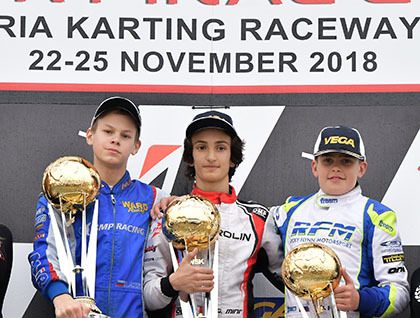 After Gabriele Mini’s performance in Las Vegas, the 2018 season ended in Adria with the third and final event of the WSK Final Cup in the rain. While Mini’ concluded with another victory and the 2nd place in the Championship, the rise of the Parolin chassis continued in 60 Mini. Always at the forefront of the category, Brando Badoer unfortunately dropped out in the Final and had to settle for 4th place in the standings of the Italian series. Brando Badoer had once again shown great potential in 60 Mini with four wins and two fastest laps in the Qualifying Heats after a retirement in view of the finish in the first heat. 2nd in his Prefinal, he unfortunately dropped to 16th on the last lap of the Final and could not improve his 4th place in the Championship. The American Mateo Rubio Luego was very successful in his first race with Parolin, 4th in the heats after his 5th fastest Qualifying, but he had to give up in the Final. Russia’s Maksimilian Popov was 4th in Prefinal B but lost many positions in the Final. His compatriot Kosntantin Krapin qualified narrowly in a beautiful Prefinal B. Finally the Emirates driver Keanu Al Azhari progressed well from 20th to 14th place in the Final. Note that all Parolin Racing Team drivers qualified for the Final. Starting from the 10th place in the OK-Junior Heats, Gabriele Mini’ had three wins in his four races, including two fastest laps. Winner of his Prefinal, again the fastest, he led from start to finish in the Final and won masterfully with a lead of over 8”. 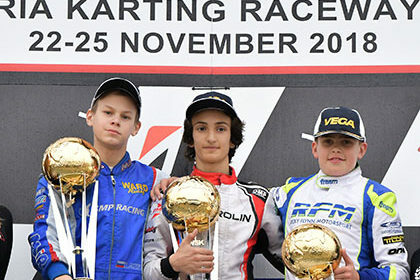 Vice-Champion of Europe, Vice-World Champion, 2nd in Las Vegas, Gabriele once again finished 2nd in the WSK Final Cup. After setting the 52nd time in Qualifying, Alessandro Cenedese had a good recovery in the heats up to 21st, but had to give up at the start of the Prefinal. The young Norwegian driver Martinius Stenshorne, just up from 60 Mini, started badly with his 70th position on the clock. He returned to 41st at the end of the heats despite some penalties and qualified in an incredible 9th place in Prefinal B. He continued his climb to 14th position, a gain of more than 50 places during the meeting. Finally, Lithuanian Kajus Siksnelis made his debut with the team. A penalty of 10” for having exceeded the limits of the track in the last heat definitively affected his progress. “We are now going to celebrate this great season,” concluded Marco Parolin. “And we will immediately get back to work to build on our commitment to racing in order to prepare our strategy for 2019. After 2018 we have a good trajectory to continue along“.